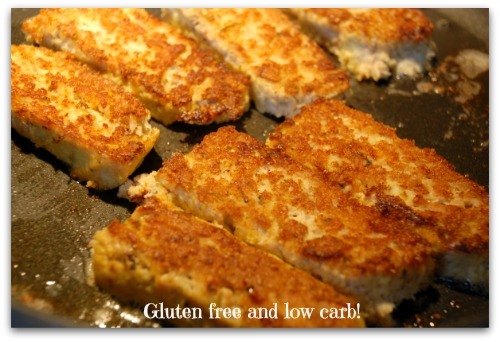 Healthy fish sticks that are gluten free and low carb? These are spectacular! Are healthy fish sticks even possible on a low carb diet? I mean the ones that are crunchy, pan fried in oil with moist light tasting fish inside? I loved them as a kid and it was with some regret I waved them goodbye as an adult once I learned to read the Nutrition Facts Label on the boxes... OMG! Frankenfood! Well, get this. After creating a very tasty low carb salmon loaf the other night, I had some left over slices. In fact I had 2 servings left. It dawned on me that these slices might taste really good reheated by pan frying them in butter. I didn't even imagine that the almond flour used in the salmon loaf would not only provide the crunch factor I was looking for, but it also mellowed the flavor of the salmon considerably. So to get this healthy fish sticks recipe, you have to make the loaf first! But it's worth it. 4 slices salmon loaf leftovers, cut into "sticks"
Heat butter or avocado oil in a non-stick pan over medium heat and gently place the leftover salmon loaf slices cut side down into the butter. Pan fry until lightly browned and crispy on one side, about 5 to 7 minutes. Carefully turn the slices over to brown and crisp the other side as well. The almond flour in the loaf adds a completely new taste and textural experience once the slices are fried this way. Drizzle with a little lemon juice or serve with homemade tartar sauce. Simply mix 2 parts mayonnaise with 1 part sugar free green relish. I served a simple green salad with a few chopped English cucumbers and a handful of thinly sliced radishes drizzled with avocado oil and apple cider vinegar. It was a very satisfying lunch that kept us going without the need for a snack for many hours. So now I'm on a quest to try other kinds of fish to create fish sticks without having to make a loaf first. Oh the kitchen fun never ends! And hey, I was really thrilled with this happy little discovery. Sometimes it's really good not to plan so much. Just go for it and see where you end up! By the way, if you like the economy of cooking using canned fish, I also have a really awesome low carb fish cakes recipe featuring canned tuna. These too have a really nice crisp exterior. Lets go back to the HOME page from Healthy Fish Sticks.